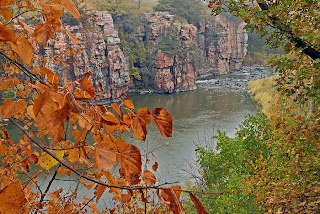 Palisades State Park is one of the smaller parks in South Dakota, but is filled with great photo opportunities. 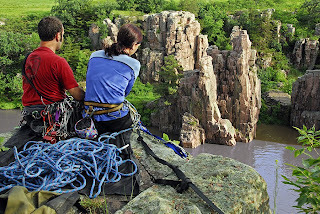 You can find Palisades just south of the town of Garretson, northeast of Sioux Falls. The route from Exit 406 on Interstate 90 is well-signed. Split Rock Creek creates the deep gorge that is the main feature of the park. Pink quartzite walls flank both sides of the gorge. Photos can be found from each side of the creek. This shot is from the southeast side. And from the northwest side in a different season. 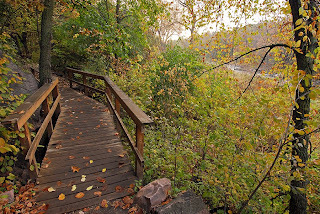 Hiking trails give a variety of vantage points from the top of the cliffs to the water level. Sioux Falls photographer Paul Schiller demonstrates one of the nerve-wracking positions from which to shoot. As always, please be careful when scrambling for that great photo spot. Palisades is beautiful in any season, but especially in spring and fall. Shooting early and/or late in the day is productive almost anywhere, but the deep gorge here makes it a little less critical. The sun does not reach down to the water until later in the morning, and rises up the canyon walls fairly quickly in late afternoon. 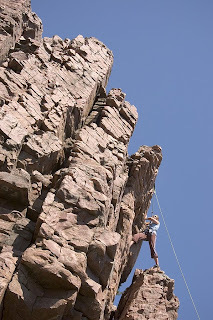 As you might expect, serious rock climbers love Palisades. They can be included in photos to go with the spectacular scenery. 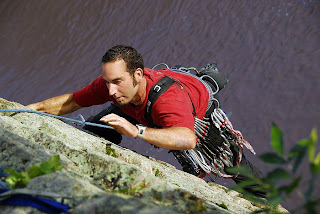 Throughout the warm seasons you can expect to find climbers on just about any visit. Another photographic resource Palisades enjoys is park manager Marty DeWitt. 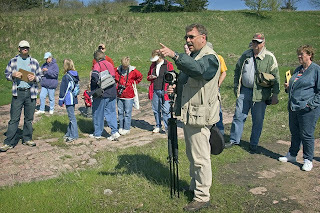 An accomplished photographer himself, Marty often leads photo workshops in the park as seen here. For more info on the park, and to check Marty's workshop schedule, visit Palisades State Park. 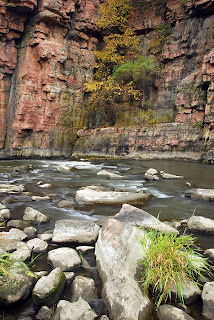 Split Rock Creek also flows through Garretson, cutting similar rock walls at Devil's Gulch. Legend has it that outlaw Jesse James escaped a pursuing posse by jumping his horse over the gorge in the city park. 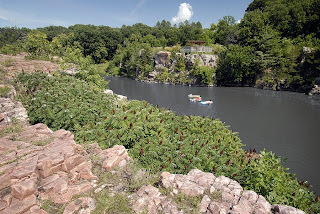 The Dells of the Big Sioux River near the town of Dell Rapids can also be found a few miles northwest of Garretson.